Quick, how many herons do we get in New Brunswick? Most of us would say one, the Great Blue Heron, some of us who listen to the news might hear the odd rare bird story and be able to name one or two more herons. Then some of us may have read through the field guide and seen a few more herons, we noticed these because they have "heron" in the name, then we notice they are very similar to some of these other birds that we had no idea were herons, so we decide to count New Brunswick's heron species. Did you know there are 12 species documented in our province? Sure some of these are very rare and cause quite a stir when located, but many are very common and many of the uncommon herons show up often enough that the novelty wears off...a bit. I grew up calling the Great Blue a crane, but there are differences, the most obvious being the neck. A heron has special vertebrae allowing it to coil their neck into an S shape, then spring it to full length to catch fish (and many other prey). A crane's food tends to be much slower, grain, seeds, invertebrates, so they don't need the spring-loaded neck to catch it. This difference is most evident in flight, herons fly with their neck folded back, so they look like they have a very short neck and large crop, a crane flies with its neck fully extended, like a goose. 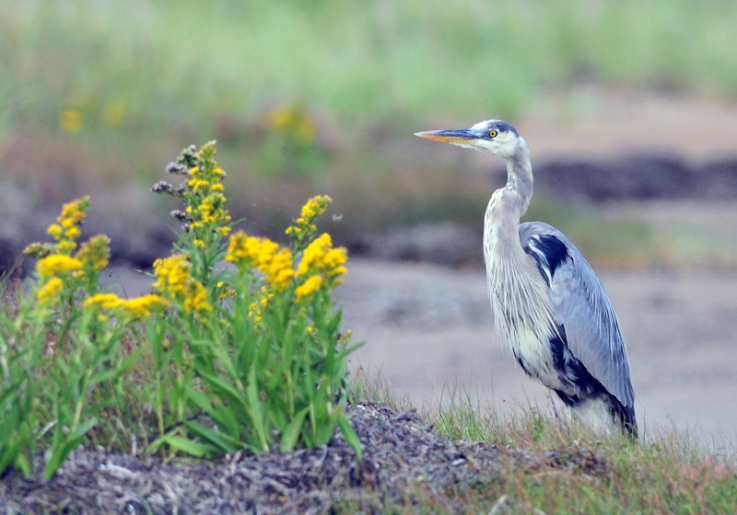 The Great Blue is a common site along any of our coasts, inland ponds, lakes and streams. They'll fish any water shallow enough for them to wade in, but they'll eat almost anything small enough to swallow, including frogs, mice and bugs. They're hardy birds, some show up on the NB winter list every year, and there are usually a few on Christmas Bird Counts. Until recently, (7 years ago to be exact), we'd have time on Christmas day to take a little drive around central PEI, the day wouldn't be complete without at least one heron (and kingfisher). As winter progresses and more of the open water freezes over these birds surely have to head for warmer climates, but they're back at the first sign of open water, trying to be first to stake claim on the best breeding grounds. The next most common of our herons is the much smaller and inconspicuous American Bittern, they take camouflage to a whole new level, extending their neck and bills straight up and even swaying with the reeds. When you see one it's usually luck, or you almost tripped over it. They'll often stay put and rely on their camo, I used to have a Peterson's CD rom and on many of the species pages you could click the RTP icon and listen to Roger Tory himself give a personal account of that bird. He told of the time he walked right up to a bittern and picked it up, unfortunately the bird didn't really like this and its neck was longer than Roger's arms. He got struck in the lip and since could never "grow a proper mustache". Every now and then someone will drop by with a box full of injured bird, if the description sounds anything like a heron I hear Roger's voice and reach for the full face shield I use for metal work and very carefully open the box. It's one thing to be pecked in the crotch by a gander who thinks the park is his exclusive territory, getting stabbed in the face by the herons dagger-like bill would leave a more lasting mark. Three egrets make somewhat routine forays into New Brunswick, last week I mentioned the Cattle Egret and Great Egret as being a couple good birds for 2011, the Snowy Egret also impresses us occasionally. Size wise they're in the middle of the two above, they too are all white, the bill though is dark and the most impressive difference has the be the black legs with contrasting bright yellow feet, they look like they're wearing rubber gloves. We get two "night-herons", the Black-crowned and Yellow-crowned, the first being common the latter, rare; although I've yet to see either. I guess as I get older I'm no longer as active at night, maybe this'll be the year I stake out a likely marsh at dusk. The rest of the heron family would create a buzz when they venture into our area, the Green Heron is similar in size and shape to the bittern, they're one of the few tool-using birds, they use bait like worms, insects even crusts of bread to lure fish to the surface where they become heron dinner. The Least Bittern resembles a small Green Heron, these little guys can forage in deeper waters where their longer legged cousins can't fish. They are small enough to straddle reeds or walk on vegetation. The Little Blue Heron is a medium-sized heron, the adults are a uniformly dark blue, they lack any of the contrasting white, black and rufous of it's Great cousin. Where these guys would trip me up is in juvenile plumage, they're all white, size is one indicator, but it's hard to judge size of a lone distant bird, so you may have to do a bit of detective work, checking for yellow rubber gloves, leg and bill colour to rule out any possible similar herons. The Tricolored Heron is another of medium size, mostly similar to the Little Blue, but they do have contrasting white on the belly, throat and head plumes. I have to be honest, until today I didn't know a Little Egret had ever ventured into New Brunswick, it must have been a tricky identification, they are only distinguished from the Snowy Egret by careful study of the lores (area between eye and bill), leg colour and plumes.